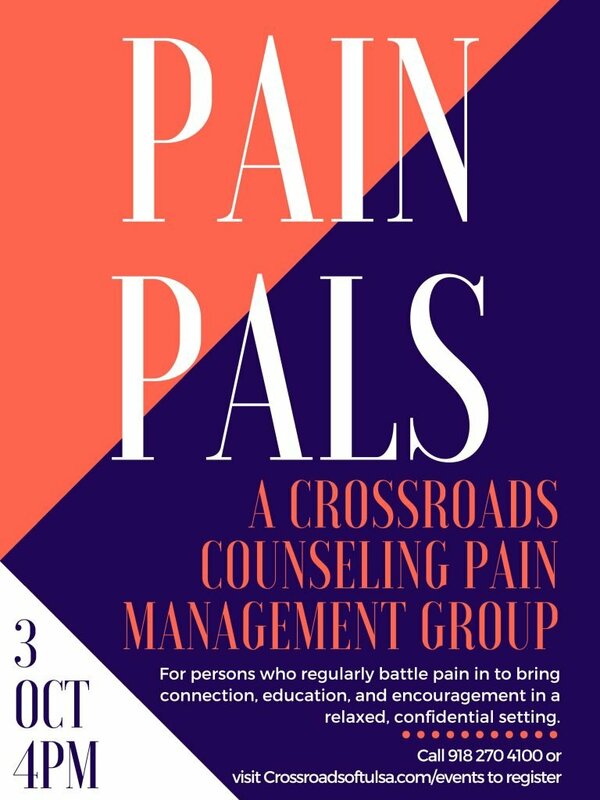 Chronic Pain Group (Pain Pals) will begin Wednesday, October 3rd. Hours will be from 4:00-5:30. 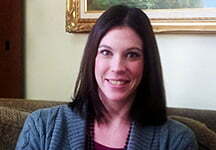 My group leading experience includes six years leading the Anxiety Group at the Mental Health Association of Oklahoma. 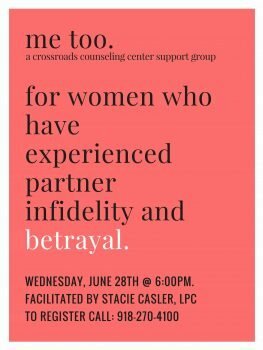 I have led a therapy group for adult victims of sexual abuse. I have led processing groups at Brookhaven and Laureate and Aftercare groups for persons in recovery from alcohol and drug dependency. In introducing me to prospective clients, please emphasize my 20+ years of counseling experience with individuals, families, pre-marital, and married couples. 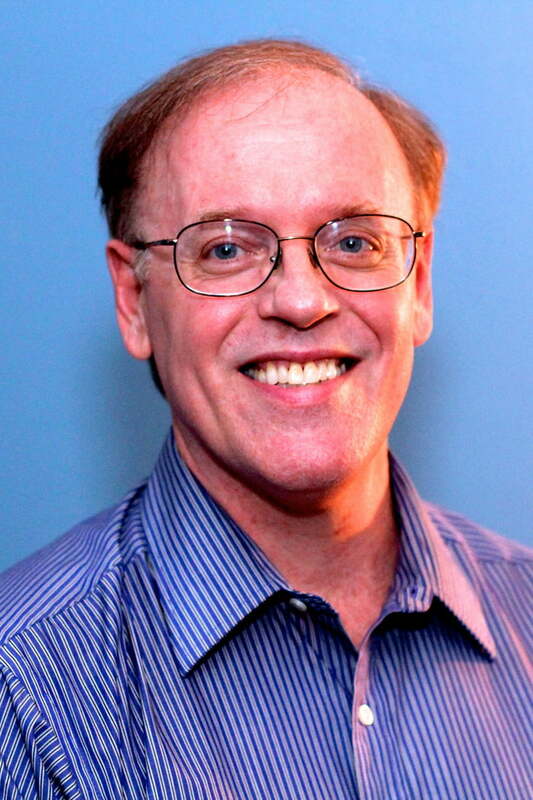 I am a lifelong learner and am now a candidate for LPC in the state of Oklahoma. Therefore I am able to offer lower rates than other counselors on staff. Please assure them I will be able to confer with colleagues as needed to best help them. Basically, although working on licensure, I am no novice in the field. I have a compassionate heart and am thrilled at the opportunity to work with persons needing care. 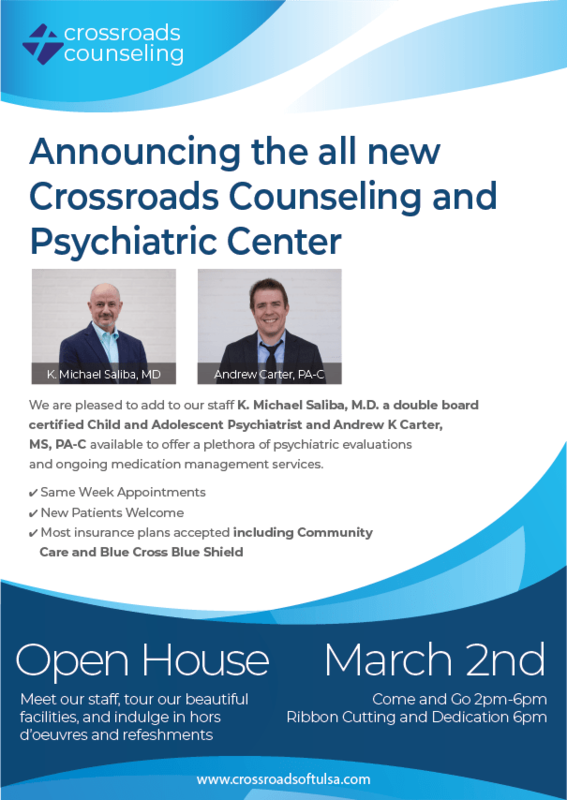 We are excited to announce our new Psychiatric Center at Crossroads Counseling. Late last year we completely remodeled our existing facilities and added a half dozen members to our staff! In order to better serve the medical and mental health community we now offer psychiatric medication management for both children and adults. We are honored to add to our staff Child and Adolescent Psychiatrist Dr. Michael Saliba and Andrew Carter, PA-C.
Our clinic will provide SAME WEEK appointments for psychiatric medication assessments, offering morning, afternoon, and evening appointments. We accept all major insurances including Blue Cross, Cigna, and CommunityCare starting March 1st, 2018! We appreciate all you do to help advance the health of our community and we can’t wait to see you on March 2nd!